One can forgive the Baltimore Orioles if they wonder if they will ever beat the Yankees. Everything that had happened this series, heading into tonight, was leaning Baltimore’s way. They had come back from Wednesday night’s crusher. Every game was close throughout, exactly the way the Orioles have won games all season. The Yankees were even more stricken by A-Rod drama than usual. And yet: They couldn’t break through, even in their magical season. Everything broke right for Baltimore all season, and so much went wrong for the Yankees. Yet the Orioles still couldn’t do it. The Yankees beat the Orioles 3-1 tonight to win their American League Division Series 3-2 in yet another gripping, tense game played just the way the Orioles wanted it to be. The difference, just like in Game One, was that the Yankees had CC Sabathia, and the Orioles did not. Sabathia pitched one of his best games as a Yankee – he’s had a few – and other than one “rough” inning, the Orioles never had a chance. It seemed surprising when Joe Girardi sent Sabathia back out for the ninth after he gave up three hits and a run in the eighth, but it was difficult to blame him. In a series in which the Yankees faced one chaotic situation after another, Sabathia was calm and in control throughout. He’s the reason the Yankees won this series. He might have been the only reason. Considering the Yankees had been hitting like a lineup full of pitchers – pitchers with claws for hands, carrying only genetically oversized celery stalks to the plate – it was fitting that they took to manufacturing their first run. Mark Teixeira, the Yankees’ best hitter this series, corked a single to right to lead off the fifth and then, because no one was holding him (because he’s Mark Teixeira), he took off and stole second base. (He actually stole two bases this year, if you can believe that.) Raul Ibanez then singled him home, and Hammel’s perfect game was suddenly a 1-0 deficit, National League style. It has come to this: They’re treating Mark Teixeira like Nate McLouth now. Dire times, but whatever works: TBS helpfully pointed out that the Yankees’ three hits in the inning had tripled their output (one, if you don’t want to divide) in the previous nine innings. An Ichiro double in the sixth scored Jeter, and suddenly, the Yankees had a 2-0 lead that, the way Sabathia was pitching, felt like 20-0. When Curtis Granderson – who hit the ball hard every time he was at the plate tonight; maybe he’s gonna break out of his worse-than-you-know-who-slump -- homered in the seventh inning, the ALCS was essentially a formality. Look, too: Alex Rodriguez didn’t show up in this recap once. As if you weren’t happy already that the Yankees had won. Meanwhile, those poor Orioles. Those fans, again, can’t help but think they will never, ever get a better chance to beat the hated Yankees. But they couldn’t. 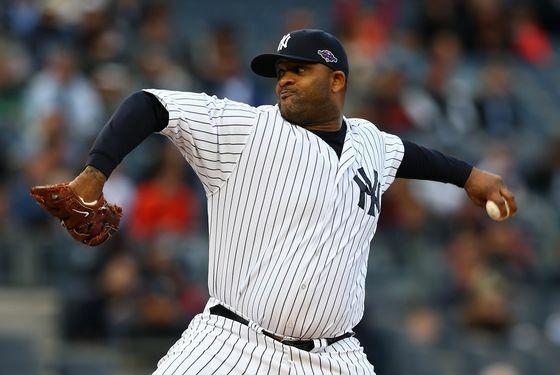 The couldn’t solve Sabathia. Which is why they, like you and everybody else, will be watching the Yankees play the Detroit Tigers in Game One of the American League Championship Series tomorrow night. Yes, tomorrow night. No nights off this year: The celebration will be truncated. This begins immediately.